Using Fold3 this past weekend I found two POW’s and two amputees – all Civil War Confederate Army veterans. I knew two of my 2nd great-grandfathers had fought in the war, but I didn’t know one had been captured during Sherman’s march…Or that four brothers of the other 2nd great-grandfather had fought in the war, too…Or that two of them lost limbs after suffering gunshot wounds. But the most fascinating thing I discovered was the physical descriptions of two of these six men provided by the surgeon of one and by the releasing officer of the other. Height, hair and eye color, and complexion took these two men from 2-D to 3-D. The picture of them in my mind now resembles an impressionist painting, but that’s much richer than the faceless and shapeless ghosts of before. Fold3 has free and paid memberships, and a facebook page Fold3 facebook. If you haven’t visited their site, take a look. 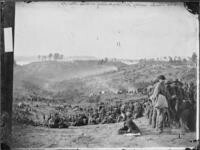 Here’s a better view of the photo above: Confederate prisoners awaiting transportation at Bella Plain, VA. Photo courtesy of the National Archives.